LOBO Systems launches construction plant, work platform solution. Construction plant is used in landscaping, agriculture, construction, waste management, forestry and mining applications. Deploying a wheel loader, back hoe, loading shovel or excavator makes your material handling and loading jobs safer, faster, more precise and more profitable. A safe working at height platform is necessary for work shop and field based maintenance repairs. 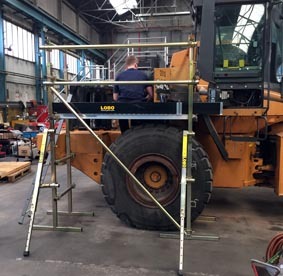 Maintenance tasks are a high priority, for example servicing, which includes regular inspections of engines, gearboxes and hydraulics, identifying faults and repairing or replacing faulty parts and carrying out routine servicing of plant and equipment. 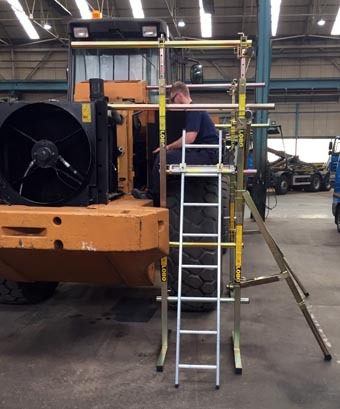 The LOBO Advanced Platform System is a perfect working at height product that offers the solution and provides a safe, sturdy and quick to assemble system around, under and over any construction plant machinery. The LOBO System is a versatile work platform product that combines the flexibility and strength of traditional scaffolding with the simplicity and mobility of tower systems. This combination provides the ultimate access system that can be utilised across all maintenance industries and no assembly tools are required. The system is particularly useful if you have awkward and restricted areas to reach and as photographed takes only 20 minutes to assemble. LOBO can be easily configured to fit all the major manufacturers including JCB, Caterpillar, Case, Hitachi, John Deere, Hyundai, Kawasaki, Manitou, Volvo and many more. The LOBO System comprises of trestle legs that vary in size, with adjustable top and fixed side bracing clamps. Steel or aluminium tubes are then passed through the clamps; the clamps are hand tightened to form a trestle. Sway braces, wheels, handrails, out riggers, adjustable extensions and even a lifting beam can be added to enhance the construction. The LOBO System can be transported from site and assembled with ease from a flat pack into any required configuration, by your own vehicle mechanics. a) LOBO is scalable, adaptable and adjustable to meet your on-going and changing requirements. Simply add more components or alter your existing configuration to satisfy the demands of the next task. Protect your initial investment with a product that will meet all your access needs safely! b) LOBO is a rigid and stable product, which meets or exceeds current safety regulations. Handrails can be fitted in seconds, at any point in the erection process. c) LOBO’s steel structure ensures many years of product life cycle and a system that will not shake or rattle. The system also includes a slider lifting beam kit and a Towerstore storage unit. d) LOBO’s modular approach means components fully integrate and can be hand carried. Fully constructed systems can also be made mobile by the addition of wheels. Experience shows that deploying the LOBO System reduces the costs associated with hiring scaffolding and constructing bespoke access systems. By reducing your reliance on out-sourced scaffolding and engineering companies cost savings will be achieved – easily in a 12-month period. With this quantifiable reduction in costs comes the added savings associated with reduced down-time and greater productivity from your maintenance department. 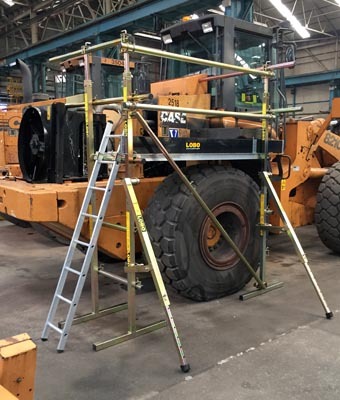 Available 24/7, quick to erect – and above all safe – it is immediately adjustable for your next job with no staff waiting time while scaffolders are engaged or new fixed-frame structures are manufactured. Re-configurable, again and again, this product comes with no disposal costs and minimal replacement and on-going training costs. Please enter your details below and we will call you back. Please fill out the form below if you would like us to contact you, or click download. Please fill out the form below to schedule a live ONLINE LOBO demo and we will get back to you. Thank you for completing the form, we will get back to you as soon as possible.